Ambien, or Zolpidem, is a prescription sleep aid used to treat insomnia. Ambien is part of the nonbenzodiazepine drug class. According to the CDC, more than 9 million people in the United States take prescription sleep aids. An estimated 50 to 70 million Americans suffer from sleep disorders like insomnia. A lack of sleep can lead to chronic mental and physical health issues, and can severely affect someone’s performance at work and school. Sleep deprivation can also increase the risk of traffic accidents. The CDC also estimates that each year, 6000 fatal traffic accidents are attributed to drowsy driving. Ambien withdrawal can be very painful and without professional assistance, it can be dangerous. Women tend to suffer higher rates of insomnia than men, and the majority of people who take drugs like Ambien are older, white, educated females. From 2005 to 2010, Ambien-related overdose rates rose 220%. People who are addicted to Ambien will often mix the drugs with other prescriptions, such as opioids, or take the medications with alcohol. Alcohol use is incredibly dangerous with Ambien. Both drugs will suppress breathing, leading to seizures, coma, and death. Ambien can give the user a hypnotic ‘high,’ which some people will abuse by taking Ambien and forcing themselves to stay awake, or intensifying the high with other substances like alcohol. People who take Ambien to treat insomnia may find themselves developing a tolerance to the drug because Ambien has a short half-life. It is designed to help someone fall asleep, not stay asleep. People will take Ambien at the correct time before going to bed, and promptly fall asleep. However, Ambien can wear-off in the middle of the night, and the person will wake up and take another dose even though it is against the dosage recommendations. If this happens, people can quickly develop dependence and addiction. Once an addiction is formed, people who stop taking Ambien will experience painful withdrawal symptoms, including rebound insomnia. Rebound insomnia is incredibly difficult to treat, and can severely limit the quality of someone’s life. Exhaustion can cause accidents, and suppress someone’s immune system, or lead to cardiac distress in at-risk individuals. For those suffering from Ambien addiction, getting help from a medical detox center is crucial. What is the timeline for Ambien withdrawal? Ambien withdrawal symptoms begin within 48 hours after the last dose. Acute, intense symptoms start within three to five days and fade within about a week or two. However, psychological symptoms can linger for months. What are the physical issues that arise during the withdrawal process? What emotional or psychological symptoms will someone experience when they stop taking Ambien? Is there a difference between cold-turkey and medical detox from Ambien addiction? Yes. Cold turkey detox for drugs like Ambien is dangerous. Seizures are a risk with sudden cessation. Also, rebound insomnia is likely with a sudden, cold turkey detox. And people with underlying cardiovascular issues can make symptoms worse or potentially dangerous if someone were to quit taking Ambien suddenly. With drugs like Ambien, medical detox is highly recommended. Trained doctors can put patients on a tapering off schedule, where small amounts of the drug stay in the person’s system over a period. Tapering off allows the body to wean off the medication, lessening withdrawal symptoms gradually. What is safe to take during Ambien withdrawal? Small doses of Ambien or replacement sleep aids with longer half-lives are safe to take during detox. Also, patients can be given antidepressants to lessen the symptoms of depression and anxiety. Anti-nausea medication is also safe to take during rehab. In some cases, patients may need medicines such as beta blockers to help with potentially dangerous changes in heart rhythm. What isn’t safe for Ambien detox? It isn’t safe for people to try and detox without medical help. 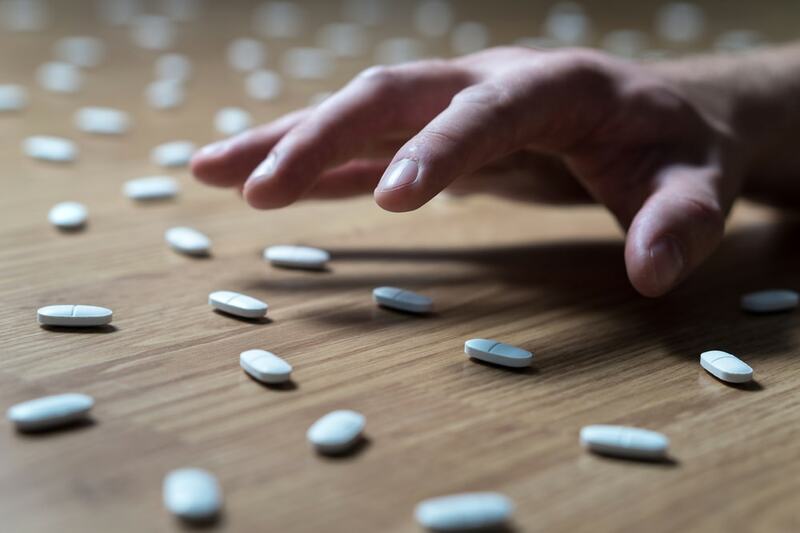 Deadly seizures are a risk with sudden cessation, and people who are in recovery from Ambien addiction can develop severe depression and anxiety. Also, people should avoid caffeine during Ambien detox, because it can worsen rebound insomnia and heart palpitations. What happens during the Ambien withdrawal process? During Ambien detox, patients are assessed for underlying mental and physical health conditions that can be made worse from withdrawals. In a medical detox center, doctors work to minimize the risk of seizures, heart problems, rebound insomnia, and anxiety and depression. They will develop a tapering off schedule for the patient, and administer medications to lessen withdrawal symptoms. After withdrawals subside, patients can begin a stay at an inpatient rehab center, where they will work closely with trained, supportive counselors to prevent a relapse and learn how to live a drug-free life. Counselors will give them the tools and support recovering patients need to stay clean. People who attend inpatient rehab have higher rates of maintaining ongoing sobriety than those who don’t attend rehab. Does Ambien withdrawal differ from other sleep aids? Ambien, unlike most sleep aids, comes in extended-release tablets and immediate release tablets. For those addicted to extended-release tablets, withdrawal symptoms will take longer to form and subside. Also, people who’ve been abusing extended-release tablets tend to take more Ambien over a short period. Because the drug is designed to release smaller amounts of the drug into the bloodstream, people will take large doses of Ambien to get the intended high or effect from the medication, compounding the amount of Ambien in the blood. People who’ve abuse immediate-release tablets, however, will see a sudden onset of withdrawal symptoms with can be particularly intense and distressing. How are people affected differently by Ambien withdrawal? There are many factors which influence the timeline and severity of withdrawal symptoms. Despite the different factors influencing a person’s risk of developing lingering and intense withdrawal symptoms, medical detox centers are equipped to help people as individuals. Treatment and ongoing maintenance plans are customized and tailored to the individual and anyone who wants to get help can find it at a medical detox and rehab center from trained doctors and therapists.